This is actually quite easy with MailServe. Look for the Postfix button. It should be at the extreme right of the MailServe Toolbar. 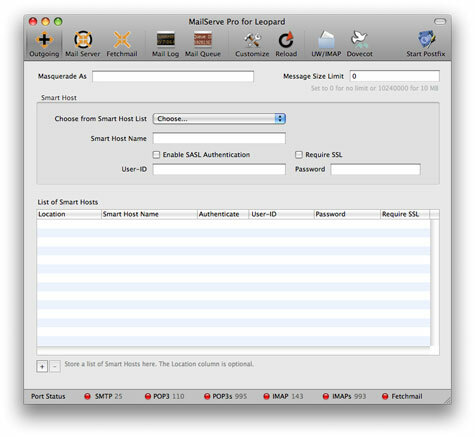 Click on it to start the Postfix SMTP server. The SMTP port status indicator light at the bottom-left of the window will turn ember for a while and then green . And the Postfix button label will show "Restart Postfix". This will be your cue that the SMTP server is now active and ready for use. Generally, that's about it. With the Postfix SMTP server now active, you should be able to send mail from a mail client like Mail.app running your server machine, as well as any PHP or command-line scripts. There are a couple of cases where this is not enough and you would have to take the additional step of setting up a Smart Host. One is where you're on a network whose ISP blocks port 25, thus preventing your server from sending out any mail—unless the mail is routed first through the ISP's designated SMTP server, using it as a Smart Host. The other is if your server is on a dynamically assigned public IP address and you're finding a lot of your outgoing mail being returned as spam—this is because some mail server admins assume that all mail coming from a dynamic IP address are spam (which is a rather simplistic assumption but never mind). In either of these cases, the problem can be solved by routing your server's outgoing mail through a Smart Host. Please read the "Setting up a Smart Host" section below. 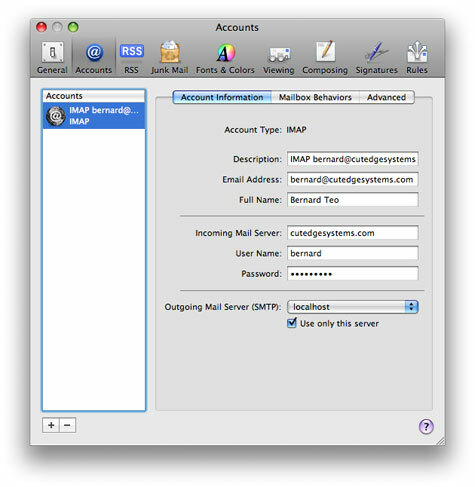 This is how you set up Mail's Account Preferences, running on your server machine, to send mail out the local SMTP server that you had just enabled. The Incoming Mail Server is any POP or IMAP server that I currently use. The important setting is for the Outgoing Mail Server (SMTP), below, which I've set to "localhost", localhost being the correct technical term for the local server. This is how I've set up "localhost" and associate it with the, e.g., "bernard@cutedgesystems.com" account. So, if I create a new message in Mail and send it to my intended destination using the "bernard@cutedgesystems.com" account, I would be effectively sending it out that local Postfix SMTP server that I had just enabled. If my ISP doesn't block port 25, and if the destination mail server is not running any spam filter that blocks mail from dynamic IP addresses (assuming that I am sending mail from a dynamic IP address, as is usually the case with machines on broadband networks), then my message would reach its destination. If not, I'll need to set up a Smart Host (see further below). Place this script anywhere on your server and run it by typing the script's URL from a browser. If all goes well, you'll see the message appear at your destination. Otherwise, you may need to set up a Smart Host. This is how you set up a Smart Host. First, check with your Internet provider and ask them for an SMTP server you can use as a Smart Host. Ask if you need to authenticate with it, the user name and password you should use, and whether it requires the connection to be made over SSL, or via a port other than port 25. 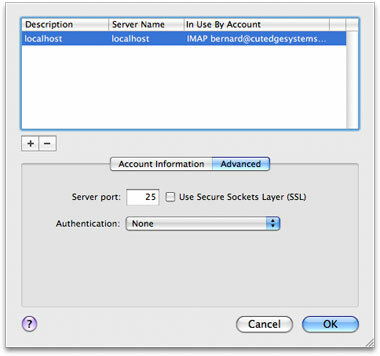 Enter all these parameters into the MailServe interface, as shown below. If you prefer not to ask your ISP, then the parameters you should use are probably those you would enter into a Mail client like Mail.app, if you were to use your ISP's designated outgoing SMTP server as the Outgoing Mail Server in Mail's account preferences. But do note this : some ISP network admins have set up their SMTP server to, specifically, refuse to relay for mail coming from another mail server, as opposed to a normal mail client. So it's often important to check. Some ISPs may simply unblock port 25 for you, if you would just ask. If you need to keep a list of Smart Hosts, for when you are on different networks or locations, store them in MailServe's Smart Host list. You can pick them up in the popup menu when you're setting the Smart Host.